Clogged kitchen is a nuisance. We at Pompa plumbing offer kitchen unclogging services at your door step. Pompa plumbing is the most trusted plumbing company in North Hollywood. If you are experiencing a clogged kitchen just give us a call at (747)200-4222 and we will schedule an appointment that fits your schedule and meets your needs as soon as possible. How to keep your kitchen sink safe from getting clogged? Run hot water through the kitchen sink after each use. Never allow egg mixtures into your kitchen sink drain. Unpleasant odours coming out of the kitchen sink. 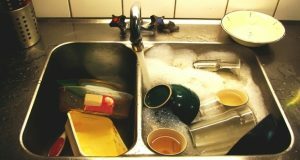 Clogged kitchen sink tends to emit foul and unpleasant odour. Gurgling noises coming from your kitchen sink. If you are experiencing any of the above signs feel free to give us a call at (747)200-4222 and we will come to your home as soon as possible to unclog your kitchen sink.